Although blamed on the economy and shifting consumer preferences, the decline of Sears Holdings (which includes both the Sears and Kmart retail brands) is really a combination of retail worst practices, an outdated core business strategy, and a big and old brand image. 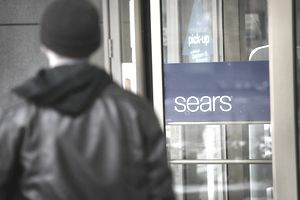 The question that retail investors, analysts, and customers have been asking for years is "Can Sears be saved from Chapter 11 bankruptcy?" And, if so, will that happen by shifting the Sears core business strategy from retailing to real estate management? According to the reports and ratings from analysts, customers, stockholders, experts, and spreadsheets in recent years, Sears was one of the worst companies to work for and had one of the worst reputations of any company in the world. Sears is not the safest retail investment, not the most respected by money managers, not the best corporate citizen, and not the most ethical company in the world. Sears.com is not the customer favorite website for apparel and really not the customer favorite for any aspect of internet shopping. The Sears brand isn't the most patriotic, it's not the most green, and the Sears brand is definitely not the most valuable retail brand in America. So what exactly IS Sears? Compared to the other largest U.S. retail chains we can only say that Sears is two things—big and old. And I bet if one of the many research consulting firms that likes to analyze and quantify the retail industry from every angle would do a word association survey, their results would be the same. When people think "Sears," they think "big and old." So if founder Richard Sears was reborn what would he make of all this? Of course, that's a paradigm without context and therefore a question without an answer. But one thing we do know is that Richard Sears was an opportunist before he was a retailer. Reportedly Sears got into retailing in the first place when he was working as a railroad station agent and a COD shipment of watches from a manufacturer was refused by a merchant. As the story goes, instead of sending the package back to the sender, Richard Sears was inspired to seize the opportunity to pay for the package himself and see if he could sell the watches. Less than 20 years later, Richard Sears was reported to be worth $20 million from his little watch venture that he grew into a massive retail catalog empire. Based on that history, I think an opportunistic Richard Sears would approve of how Sears Holdings is slowly transforming itself from being a company that sells stuff into a company that leases space where other people can sell stuff. As far back as 1906, the Sears Roebuck company controlled 3 million square feet of commercial real estate which reportedly made it the largest business in the world in terms of property. So it's not surprising that 228 years after its official founding, Sears Holdings (SHC Realty) has a real estate portfolio that is currently one of the largest in the world for corporate organizations. Sears Holdings has more real estate that it could lease out than Simon Property Group, the mega mall landlord and the biggest real estate company in the world. "Real estate monetization" seems to be the prevailing Sears strategy these days, and Sears shareholders have expressed their approval for the Sears shift to real estate priorities by voting with their investment dollars every time Sears makes a move that leverages its real estate portfolio into ongoing income or cash. Basically, Sears Holdings is quietly conducting a proactive Chapter 11 reorganization of its business without the interference of a court-appointed trustee or the hassle of any court-mandated actions. Putting all historical retail sentimentality aside, Sears leaders are dispassionately doing what needs to be done to keep Sears Holdings a viable business concern. Prospects are good for the Sears commercial real estate activities in the present and the near future. The post-recessionary glut of cheap space is gone and retail vacancy rates are at pre-recessionary levels in most places. It's good timing for Sears to make some of its retail space available to retailers that are more retail relevant and still expanding by opening new stores. Supply and demand should fetch Sears some good lease rates for its retail square footage in prime locations throughout North America. Any success that Sears Holdings generates as a retail landlord is not going to make it a better retailer, however. As long as it still has retail doors open, Sears is going to have to figure out how to be a good retailer, or at least a "good enough" retailer to find the way back to black. We have few clues about how Sears leaders are going to do that, which is probably a reflection of more of the same cluelessness that has been hiding behind Sears boardroom doors for years. But buried in a landslide of negative reports are two pieces of positive progress for Sears retailing. Sears leaders have been focusing on improving the International Lands End website shopping experience and expanding it at the same time. And Sears leaders are also encouraged by the 65% of sales that are coming through the "Shop Your Way" customer loyalty rewards program. Shop Your Way participation is being interpreted as meaningful progress towards transforming Sears into a member-centric company. A membership business model might work for Sears in the short-term if the marketing is aggressive and the "rewards" are good enough. But at some point, Sears is going to have to answer an essential question for Sears "members" that it hasn't been able to sufficiently answer for Sears consumers for years. When you "join" Sears, what exactly are you a member of? Exactly what is Sears retailing all about? If Sears leaders can't come up with a better answer than "big and old" that consumers buy into, then it will eventually be relinquishing all of its prime retail space to retail tenants that are more worthy. From a dispassionate point of view, at some point, Sears is going to have to justify its own retail existence to the keepers of the spreadsheets. Without a dramatic redefinition and a new retail identity, it won't be able to.